Undertones? In Paint Colors? What’s that? You may have heard the word, ‘undertones’, but never quite knew what it was. All colors have an undertone — a color that’s present, but not always obvious depending on the lighting and what other colors surround it. What might seem like a safe neutral beige can reveal an unwanted tint of pink after you’ve spent hours (more like days), painting your walls! Ugg! When it comes to painting your home, aim for a smooth color transition from room to room. 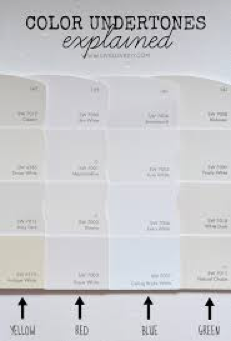 Narrow your paint choices by choosing the same undertone for the space adjacent to the room you want to paint. If one room is beige with a subtle green undertone and you want to paint the room next to it a blue-gray, try a blue-gray with a slight hint of green. Getting the undertones correct in paint is important; getting them right in hard surfaces — materials not easy or inexpensive to replace like tile, flooring, countertops, and stone, it’s crucial. 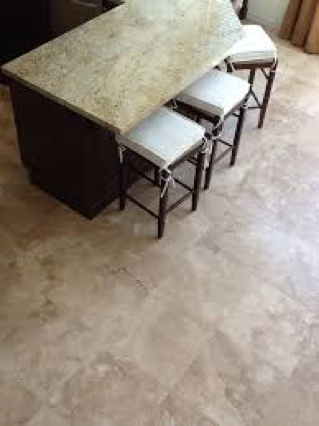 Here you see a yellow/beige undertone countertop with a pink/beige undertone floor. This is the #1 very expensive mistake homeowners make. All beiges, grays, whites, greens, blues, etc are NOT created equal! And when the mistake is made on hard surfaces, it’s a costly disaster! NEXT POST: Can You Afford an Interior Designer?